I love when there happens to be an inexplicable sign from somewhere that there’s beauty we’re not even seeing. I often feel living in the Midwest prairie that I forget that even if I’m not looking at a mountain or ocean it is all a part of God’s Earth. Through the years I have gotten a lot of joy out of physical accomplishments. I usually run at least one or two 5K’s a year and try for one half marathon or 10K. For some reason in 2016 at 6 months pregnant I had a crazy notion that I should sign up for a 30K series (3 different 10K races in 3 weeks) which started 6 weeks after my predicted due date. I know I was living some crazy dream, because not only was this a crazy soon amount of time after having a baby, but I hadn’t done any running in the last 4 months of my pregnancy! I ended up sleeping through the first two races, still recovering from my stiches and in the deepest grief. By the time the third came around a little after 2 months after we lost Logan my husband convinced me I had to go to the race and at least walk across the start! He knew what running had done for my happiness in the past and wanted to see me there again. That Sunday race morning was a wet drizzle as we all drove to the start. I think I changed my mind more than a few times while waiting for the start of the race as my husband and daughter had driven further down the route to be my cheerleaders. I’d only run about 2 miles since Logan’s birth. What crazy thing was I thinking? A 10K is 6.2 miles and about 5 miles of this race was on hills! I told myself I can at least make it to the first turn-around where the 5K was. If nothing else I have confidence I can walk 3 miles even if I don’t run. I was convincing myself with every step after that starting line, your only going to do a 5K today, accept it there will be more races. Then something happened at the first half mile. I was no longer getting pelted with the sharp pellets of rain falling. It just suddenly looked like we were all in a cloud of haze running. Then I turned the corner and the cloud around me was gone and I looked up and saw a rainbow jetting from the sky. I have never felt more that something was put there for me than this moment. I thought back to the story of Noah and the flood and the storm that he saw. The world was “broken.” Everything they knew had been changed. This was the same world I had been living in. 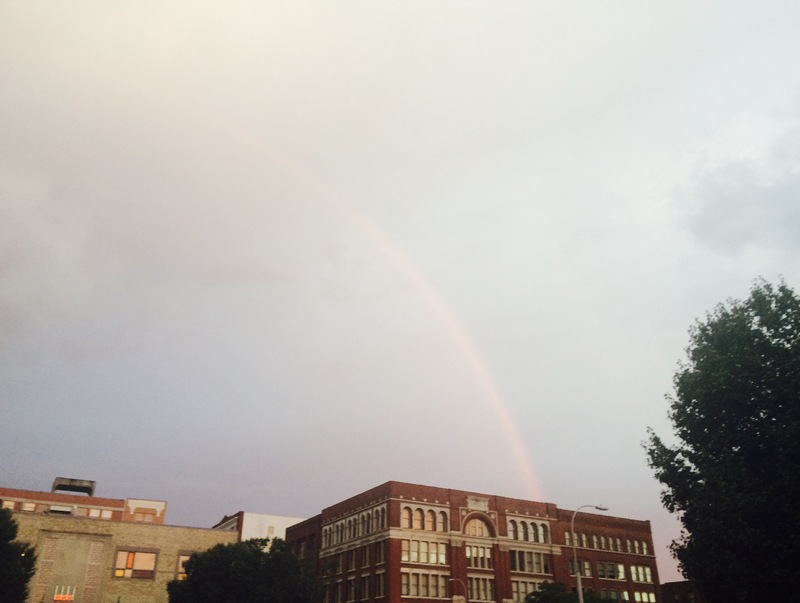 Then God gave Noah a rainbow as a sign remembrance for the covenant between God and all of creation. That the waters will calm through our storms. I did not get a pot of Gold at the end of the rainbow that day, but seeing the pride and smile in my husband and daughter as I crossed the finish line that day. I was not alone I had cheerleaders I couldn’t even see that day who pushed me on. First of all, I get it. Yes, I get and comprehend so many of the emotions you posted. Most importantly, I value your testimony of faith. I, too, cherish God’s beauty in my surroundings and I look for God’s handprint in every day’s experiences. Secondly, I get the crazy notion of signing up for a race and questioning your mental health and physical ability. I never considered myself an “athlete” until I reached my fifties. It was only by t he grace of God and the uplifting of colleagues in No Boundaries and TRI 101 that I made it across the finish line. Like you, I pushed beyond my physical and emotional ability. Thirdly, I get the self-questioning that comes with being in a race and wondering if you will make it. 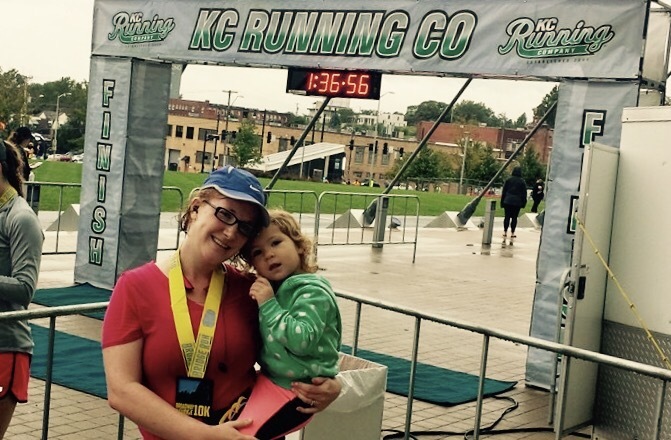 I “walked” my first half marathon in 2014 and the last hour of three hours was in the pouring-down-rain. “Am I crazy” I questioned myself. But who can let go of all that training and prep.